Off to the Pergamon Museum in Berlin? See our insider advice for a queue-free visit as well as opening times and phone numbers! During the current stage of renovation, the hall containing the Pergamon Altar is due to remain closed to the public until 2019. The north wing and the gallery of Hellenistic art are also affected by the closure. Though, make sure to buy your skip-the-line tickets online before your visit! 1. Come at the opening time. Even in high season the line at the opening is about 5 minutes long or even inexistent. In the worst case it will take about 30 minutes (which is still much shorter than the one an hour or two later). Another bonus of being an early bird is that the museum doesn’t start filling up until 10.30-11.00 : you’ll have at least an hour of peace and quite to explore the museum’s highlights. 2. Book your ticket online: that’s the best way to guarantee yourself a wait-free entrance. Try however booking the time slot that falls on the green or yellow cell in our crowd table : that will help you visit when the Pergamon Museum is the least crowded. 3. If you plan to visit at least two museums on Museum Island - think about buying the Museum Island Card to save money. Since this card doesn’t always give you priority entrance or the possibility of skipping the queue, consider other ways to optimize your day: if you think of buying the Museum Island Card on site - go to the ticket office of a less popular museum on the list, and book the time slot for the Pergamon Museum there, while purchasing the card. Or you can also start your day at the Pergamon Museum by arriving at the opening (when there’s little or no waiting) and heading to the other museums in the afternoon. You can also buy tickets at the booth on the street which is behind the Altes Museum before arriving at the Pergamon Museum. Try to save the larger, less crowded museums for peak hours: you won’t lose alot of time, because their peak hours are nothing compared to Pergamon or Neues Museum. You can also check out the Berlin Museum Pass or Berlin WelcomeCard, most of them let you book your time slot for the Pergamon Museum without extra fees! 4. Come during extended hours. While the peak hours fall mostly within 11 - 2pm, there are usually less people later in the afternoon. The Pergamon Museum has a late closing time on Thursdays, which could be a great option for visiting the place without the usual crowds. 5. Come on a weekday during the off-peak season. If you choose the date well - you can easily manage a pleasant crowd-less experience at the Museum Island. Peak months in Berlin are from July to October (while August is usually the busiest). The lowest season is winter (except for Christmas and the New Year holidays). Check the dates of German school holidays before going. Though they vary a lot in different regions, the Berlin dates should interest you more than others. If your trip doesn’t clash with any of them - lucky you! Avoid coming on Saturday, as it’s always the busiest day and you could see waiting lines for the tickets even during low season. This page will give you many tips to avoid crowds in Berlin as well as crowd schedules for top tourist attractions in order to plan your visits. The Pergamon Museum is often said to be too hot and humid: when there are crowds inside, the experience of the visit could get really unpleasant. The average visit lasts about 2 hours (or about 4 hours if you’re a real museum nerd). Free cloakrooms and lockers are available. During the construction works the main entrance may be closed. Check the official website for more details. Reduced rate: schoolchildren, students, severely disabled persons, on presentation of the appropriate identification. Free admission: children and young people up to the age of 18. 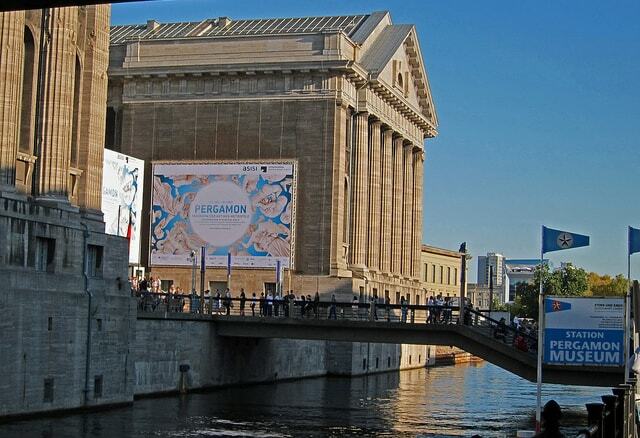 Feel free to comment or give your opinion on The Pergamon Museum. However, please agree to respect our terms. Please don’t post defamatory, insulting or disparaging comments- as we will have to moderate them. Instead, explain what happened in a factual way.